Wimauma resident Odell Scott wants to be your personal farmer of nutritional microgreens. His company, Sunfresh Microgreens, delivers freshly harvested product to your door. Odell Scott started growing nutrient-packed microgreens for his mother, who, he claimed, “never ate healthy greens. Scott had always been a back-porch farmer and even built a large aquaponics system on his five-acre property, but after farming microgreens for himself and his family, he discovered his true calling. 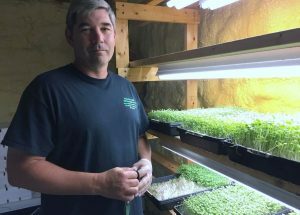 Before he knew it, the professional firefighter had developed a “hobby business,” selling microgreens to fellow firemen. Gradually, he turned it into a cottage industry business, selling freshly harvested products, grown in his insulated pole barn, to area residents and then immediately delivering the greens to their doors. His mom, Carolyn, and wife, Shana, assist when they can. “My staples are broccoli, kale, radish and sunflower microgreens,” said Scott, 52. “But I occasionally grow arugula, mustard, red clover and coriander, also wheat grass (for juicing). Broccoli/kale microgreens are the most popular super-food mix sold by Sunfresh Microgreens. They’re as delicious as they are nutritious. A five-ounce bag, grown to order, costs his customers $10. Only three years away from retiring as a 20-year firefighter, Scott wants to farm microgreens on a larger scale when he hangs up his helmet. 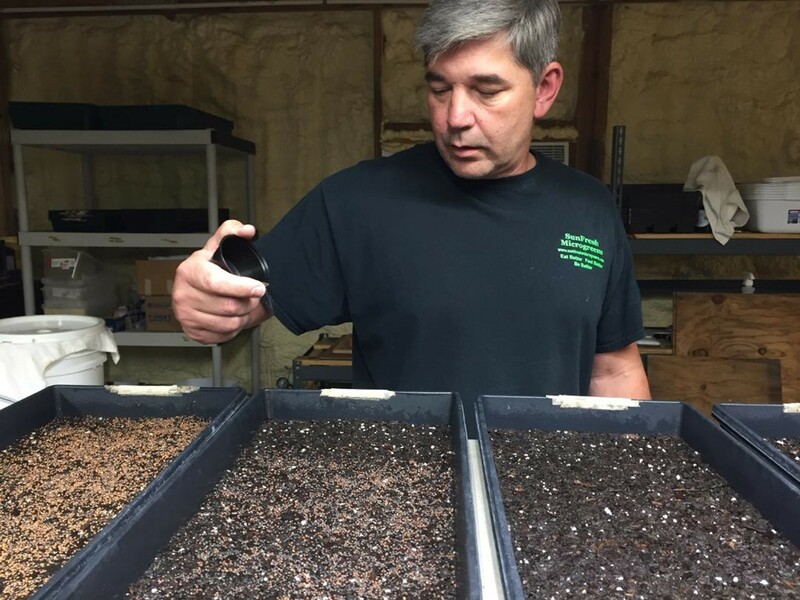 “I’d like to continue selling to my individual customers and also supply microgreens to area restaurants,” he said. As their name implies, microgreens are the first stage in the growth of a plant, Scott said. They’re harvested after the first “true” leaves have developed. Customers place their orders on-line at www.sunfreshmicrogreens.com or by calling 813-294-7355. 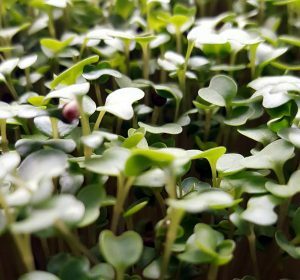 Presently, they can choose five ounces of any of the following microgreens: a broccoli/kale mix; sunflower only; and/or a mix of sunflower, broccoli, kale, radish and red clover. Each is $10. Wheatgrass is sold by the pound for $10. 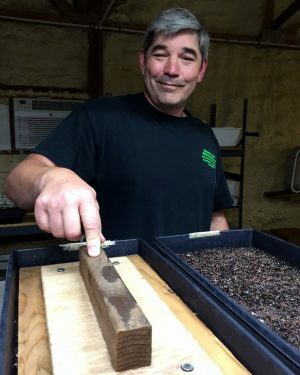 Odell Smith gently presses microgreen seeds into a tray of organic soil in his pole barn in Wimauma. Once Scott has all the orders for his next batch, the microgreens are grown to order in 10 to 12 days. He weighs out seeds bought in bulk from a certified organic seed company and sprinkles them onto organic soil, moistened with well water, gently presses the seeds into the soil, and then moistens the soil again. Scott uses no pesticides or fertilizer. They are covered and germinated for five days before going onto lighted racks to grow. Sunfresh Microgreens makes to-the-door deliveries in Brandon, South Shore and FishHawk. Customers who won’t be home at the time of delivery are asked to leave a cooler with a frozen bottle of water in it by the door. Odell Smith sprinkles radish and red clover seeds onto a tray of organic soil. The freshly grown microgreens will be ready to harvest in 10 to 12 days.